Gardening is a fun activity for the entire family. Make no mistake though, growing all your own food requires a lot of work and a little creativity. 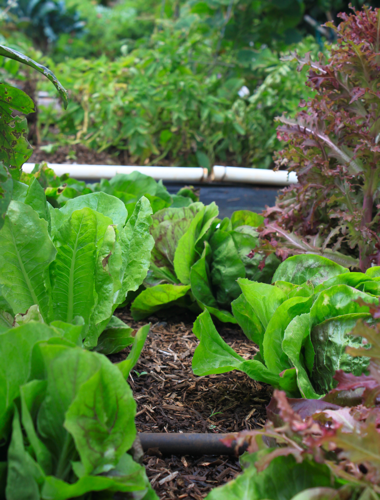 It takes dedication and several hours time week to keep a garden producing to the point of being self-sustainable. Many people define self-sustainable as the degree at which the system can sustain itself without external support (including commercial fertilizers, etc). I personally go a step further to define self-sustainability as producing all my own fruits and vegetables without the need to go to the grocery store to purchase any. Not only is the 'system' self-sustained, I am also self-sustained. This allows me to put my grocery money into soil amendments and fertilizers, organic of course! The yield I get from the garden is worth far more than the hundreds of dollars I spend on the soil. The truth is, there is no way I could afford to eat this well going to the grocery store. Have you seen the price of produce lately? It's downright frightful! After three years of steadily increasing my garden space, I can finally say the produce department at the grocery store is a place I don't often go these days. As the garden grew, so decreased my refrigerator space. At first when I couldn't eat or store everything I harvested, I parboiled it and froze it. It wasn't too long before my freezer was stuffed. Though my freezer was stuffed, I was always working on eating up the fresh, new harvest. The freezer stayed stuffed until one day I decided I had to do something different. Gardening in Hawaii is very different than most areas. 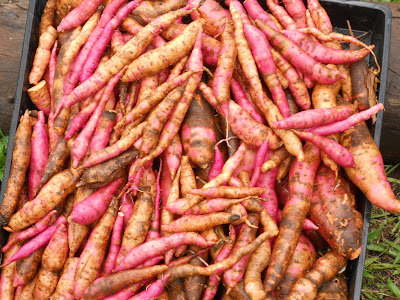 Because the mild weather allows growing year-round, we don't have the need to can and freeze harvest for use in the winter. We enjoy being able to plant anytime of year for the most part. So freezing didn't work out. I quickly discovered that gardening self-sustainably in Hawaii brings the need to figure out how to process, prepare, and share all that wonderful, organic food. 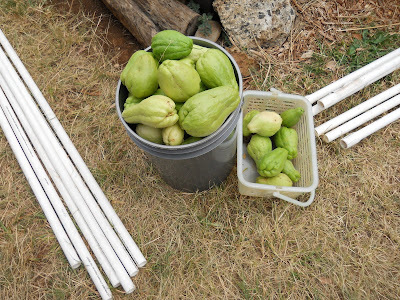 What happens when you harvest a 5 gallon bucket of yams, a 5 gallon bucket spilling over of chayote squash, or so many lilikoi (passion fruit) that they will go bad before you can eat them all? Let's face it, we all need to eat more fresh vegetables. But the cost is prohibitive. The amount of chard, onions, and garlic it takes to make a chard pie, which in my family serves 4 as a side dish, might cost $20 - $30 alone! Add to that the cost of the other ingredients and it's untouchable by all but the most wealthy. Unless you garden that is! Chard grows like a weed. Four heads of chard can provide a family with 2 to 3 huge bunches of chard every week for months! At first, I just steamed it up and put it on the plate. Later, I had more and more and we grew tired of steamed chard. This is when cooking creatively comes in! I searched around the Internet and found this recipe for chard pie. Steam chard and mix in pie plate with onions, garlic, and half the Parmesan. In separate bowl, mix eggs, milk, oil, thyme, and salt. Pour egg mixture over the chard in the pie plate. Bake at 375 for 30 minutes or until lightly golden on top. The pie is a delicious way to use up extra chard and goes over well with everyone! And when all else fails for using up these wonderful goodies from the garden, everyone loves a gift of food. Share! Share! Share!